In a post-Sandy world, waterfront residents are faced with the choice of whether or not to raise their homes. Some may worry about the esthetics of this type of renovation, but Bates Masi + Architects‘ Northwest Harbor residence shows that raised homes can be strikingly beautiful. The green-minded firm works with the environment and not against it. 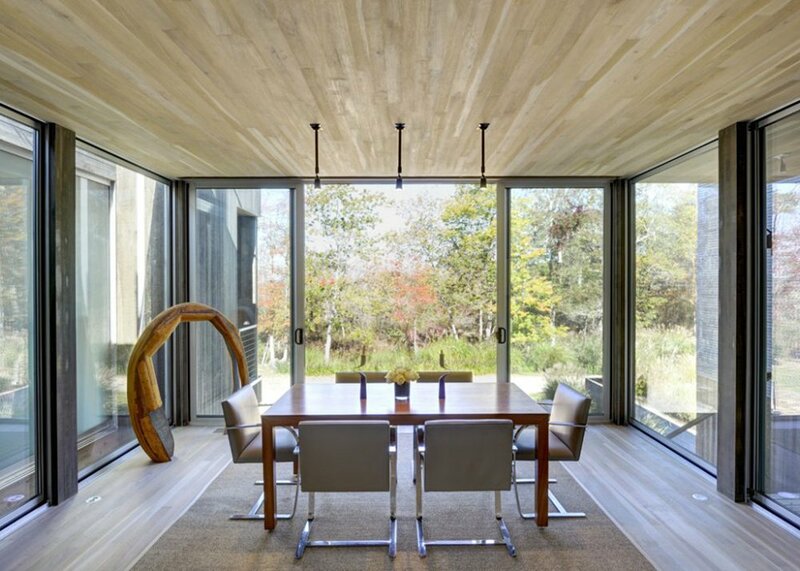 Instead of modifying this East Hampton terrain, they allowed the natural landscape to take the lead. 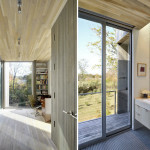 The stunning result is supported by 16 sturdy stilts that raise this wooden dwelling right above an unsettling floodplain terrain while improving the overall environmental quality of the unique wooden home. 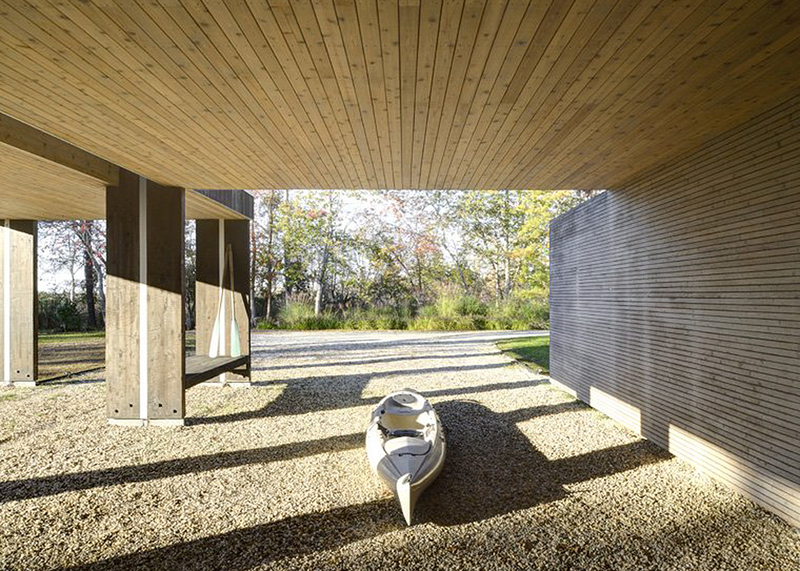 Straddling freshwater wetlands and a tidal estuary six feet above sea level, Paul Masi and Harry Bates built this wooden family home with great sensitivity to environmental concerns. 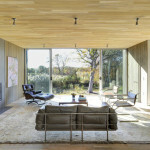 Due to both local zoning restrictions and FEMA requirements, the 1,900-square-foot house was limited to just a single story. 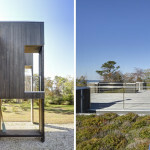 It stands eight feet above the ground on 16 exposed, glue-laminated piles, overlooking the magical East Hampton surroundings. 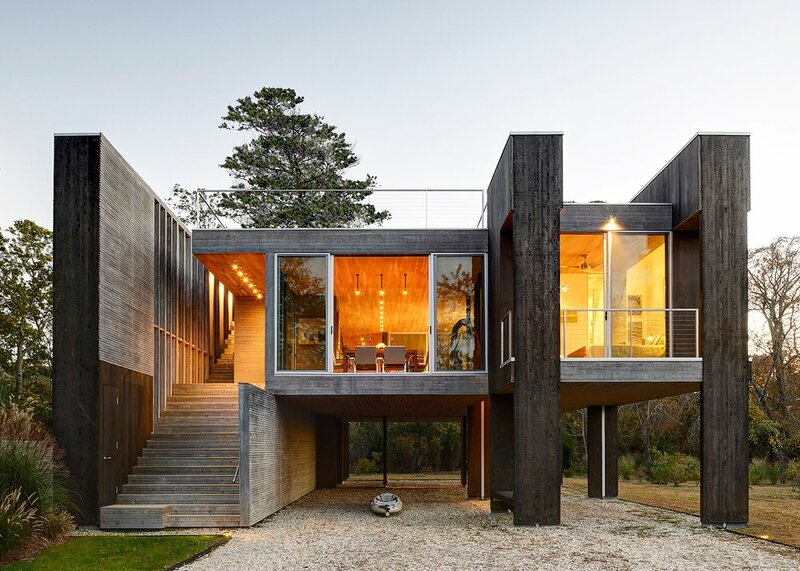 While most waterfront constructions use pilings to create a base that would then support the house, in this case the piles extend upward from the ground to the roof, creating partitions for each of the three bedrooms. They also house ‘utility’ functions inside, including a closet, a desk, a laundry, and even a shower compartment. In addition to storage space, some of these delimiting structures have open areas that improve the overall environmental quality, allowing free circulation of the inhabitants, daylight, and air through its minimalistic interiors. But the benefits of the wooden pilings don’t end there; each opening draws light from the interiors down to the parking space below, moves rainwater from the roof deck to the ground via integral downspouts carved inside, and conducts ventilation through the middle of the structure. High on the roof, the projecting piles are topped by photovoltaic panels that power geothermal pumps, making good use of the abundance of high ground water to heat and cool the house. 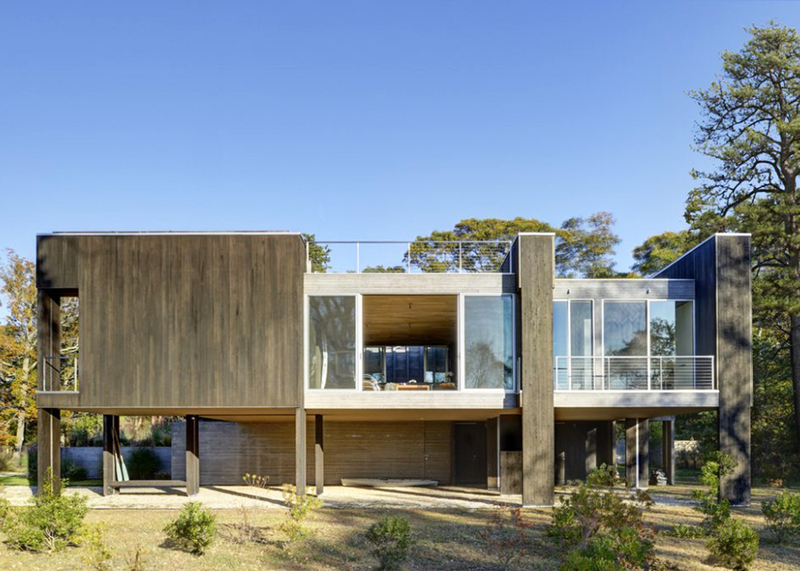 Bates Masi’s Northwest Harbor residence may look simple, but it’s a beautiful living space with magnificent engineering work behind. 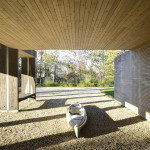 See more from Bates Masi + Architects here.